Hospitals are searching for ways to improve staff efficiency and communication. Additionally, hospitals want their patients to be satisfied without sacrificing the quality of care. The answer? Smart Technology within the coordination of care. In this article, we will discuss Smart Technology Trends for 2017-2018 that directly impact the patient’s satisfaction and will elevate coordination of care to a new pinnacle with new communication methods. Hospital beds with bed-exit alarms built in do not measure up anymore in our healthcare environment. Patients and staff need more out of their beds whether they know it or not. Automation, patient room technology and interoperability between connected systems can do the trick and is a reality today. Smart beds are continuing to gain popularity. For example, the Stryker S3 bed is a popular acute care/MedSurg that many hospitals use currently. Most hospitals utilize the 3-zone bed alarm features, however, built into the Stryker S3 for example, is a host of smart features along with conditional safety features. The Stryker safety solution is called iBed. iBed allows the user to set up conditions for the settings on the bed and if the bed is set outside those parameters, visual indicators notify the user that the bed must be put back to the safest condition for that patient. Also, the beds are set up to be wireless, removing the need to remember to plug the bed into the wall and no more damaged 37-pin connectors. The bed is loaded with sensors including weight, brake, rails, and head-of-bed angle. This makes bed related patient safety easy requiring very little upkeep. Infusion pumps with wireless adapters enable the pumps to be monitored and checked against the physician’s order in the electronic health record for medication dosages being administered to the patient. If the dosage being entered into the pump conflicts with that of the what has ordered, an alert will indicate the error and staff can be alerted. Connected infusion pumps are an outstanding innovation for smart technology in the patient room. Telemetry technology is becoming smart. Vital signs from the patient can stream into the EHR to be logged for review at a later time. Additionally, predictive modeling algorithms can process the vital signs and score the patient related to their vital signs over time as well as the patient’s acuity, mobility status and other measures. When the score reaches a specified level, the patient is at risk of a health degradation within a period of time in the near future and, the staff is put on alert that the patient is at risk of a possible sentinel event. Predictive modeling has been able to predict up to 6.5 hours in advance proactively. While this technology is coming out of its infancy, it is gaining popularity and defines the direction healthcare is going. RTLS badging is gaining popularity for the health system. For example, you can see in real time if there is a staff member in the room. Some systems allow different colors to show on the dome lights above each patient room door, depending on whether you are the nurse, aid, physician, etc. Additionally RTLS badging can be given to patients so that they can be tracked throughout the facility. RTLS tracking goes beyond real time. Tracking data is reportable to leadership. Relevant information such as rounding, patient movement, device flow and other critical information can be gained. Replacing the dry-erase board in the patient room with digital patient room whiteboards is a trend. They feature all of the critical information that the patient wants to know and that the staff needs when entering the room. Both the staff and the patient can feel confident that the information is current because the digital whiteboards are connected directly to EHR, nurse call, staff assignment systems, and other systems to gather and display the information with no manual input. The digital patient room whiteboards can be the bridge that connects all of the smart systems that we talked about in this article. Plus they are clean and easy to read. For example, the beds can feed sensor information to the digital whiteboard and if the provider has access to the feature sets, can show safety information from the beds, alerts from the infusion pumps, predictive scoring, and alerts from telemetry and staff pictures as they walk into the room triggered by RTLS badges. Assigned staff photos can also be displayed, as well as many of the common elements seen on its dry-erase counterpart. 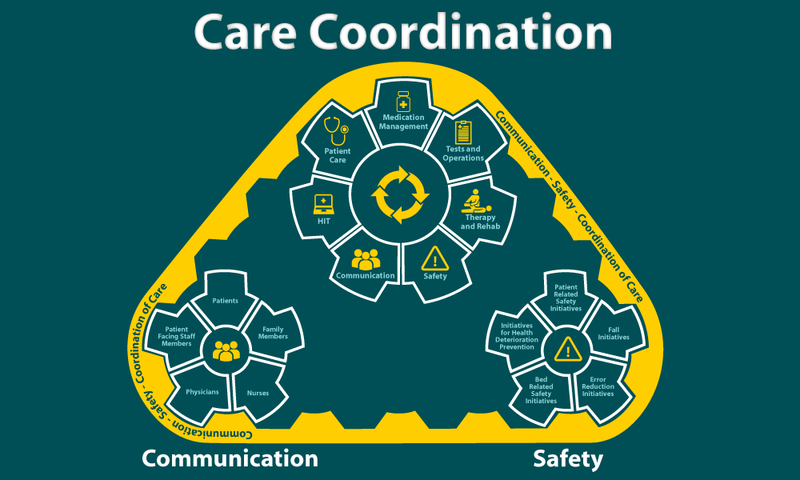 Per the care continuum graphic, it becomes apparent the importance that patient safety and communication have on patient care. Any breakdown in communication and safety initiatives cascades throughout the continuum and puts the entire healthcare process at risk. This problem is crystal clear to solutions providers and explains why technology is trending the way it is. Yes, these are exciting times for healthcare information technology. 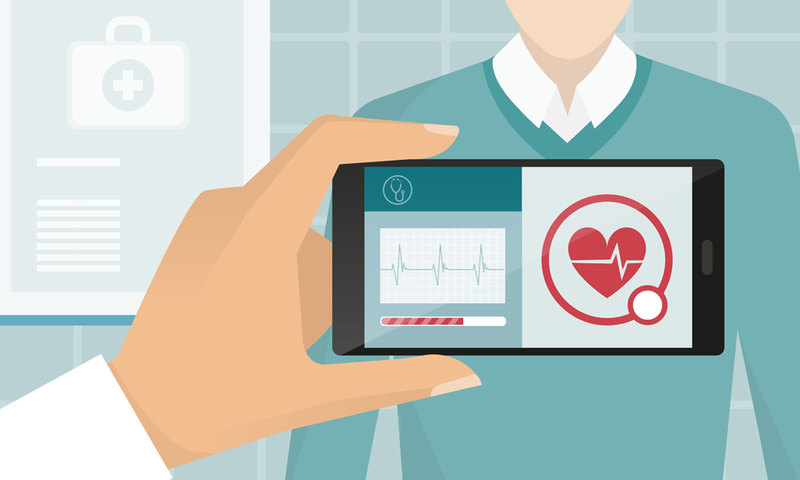 When smart technologies are correctly married together, the patient room comes alive, bridging the communication and safety gaps in the coordination of care that continue to plague healthcare systems. With the trends listed in this article as well as other smart systems being added to the hospital’s list of options rolling out and their benefits felt, there will be more intelligent systems developed; defining the future of healthcare and digital medicine. To learn more about MEDI+SIGN digital patient room whiteboards, visit us at www.medisigndisplays.com or email us at sales@medisigndisplays.com.